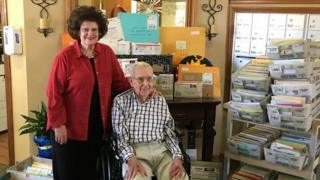 A World War Two veteran who asked to be sent 100 cards for his 100th birthday says he is "really excited" to have received thousands from all over the world. A photograph of Joe Cuba holding a handwritten sign has been shared thousands of times on social media. It reads: "I'm a WW2 veteran who will be turning 100 on 2 March 2019. I would like to receive 100 birthday cards." So far, he has received 10,000 cards - and his birthday is still days away. Joe told BBC News: "I really didn't expect all the cards. I got a whole bunch of them - and I couldn't thank everyone enough." Stephanie Veitenheimer, who works at Brookdale Midwestern Community, where Joe lives, in Texas, US, made the original appeal. She told BBC News: "I asked Joe what he wanted for his birthday and he said, 'Nothing really, just happiness,' so I said, 'Well, why don't we get you 100 cards?'" Puerto Rico, Guam, Germany and the UK are some of the countries Joe has received cards from. His post is being placed on tables in an empty apartment at Brookdale Midwestern for Joe and his daughter to look at. Stephanie said they had also heard from people in Japan, Australia, New Zealand who said their cards were in the post. The reaction had been "just mad", she added. Such is the popularity of Joe's birthday appeal, people are now sharing images on social media of the cards they are about to send. Eline van de Laar, in the Netherlands, tweeted: "My card is ready for posting. Joe Cuba, here it comes," followed by the hashtag #Kleinemoeitegrootplezier (little effort, big fun). And on Instagram, people are making their own cards for Joe and posting them under the tag #joecuba. Artists are also choosing to draw Joe and thank him for his military service. He was a technical sergeant in the United States Army Air Forces. This drawing by Bea Smith is on its way to Texas from Hungary. Petenoir posted "a little kindness" to a "complete stranger", saying: "I don't know him, I sure do wish him the happiest 100th birthday and certainly thank him for serving in a war that impacted the world." Joe's even been sent flowers from people who have seen his birthday card appeal on the platform. This is one of about 100 gifts he's been given. And staff at Brookdale Midwestern have been keeping Joe's fans updated on how his birthday celebrations are progressing, with pictures of the postman making deliveries. Joe said he had fun plans for his actual birthday, on 2 March. "All of my friends will come over for dinner and a get-together," he said. He also has a week's worth of celebrations brought about by his new-found fame, including parties and visits from schools. There's even a young kangaroo - a joey - coming to meet him.